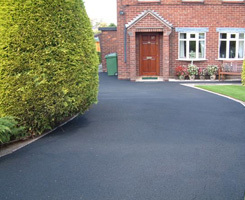 DIY Tarmac Paint – If your driveway is looking faded, worn and shabby you can easily renovate it by applying new hard wearing PICSCOAT, our industrial strength Tarmac restoration and refurbishment product. Easy to DIY and will transform your old tarmac back to a "Good as New" look. Tarmac restoration, driveway repair, refurbishment & cleaning. Yes, with PICSCOAT you really can refurbish your driveway yourself! ...protects against normal wear and tear, thereby doubling or even trebling the life of your driveway. ...severely inhibits weed, algae and moss growth on your Tarmac drive, and enables easy-clean of oil leaks and fuel spillages. ...helps prevent cracks appearing in your Tarmac drive. 1. Decide how much PICSCOAT you need. A 20ltr tub of PICSCOAT will provide excellent coverage for an area of up to 40 m2, but you can sometimes get as much as 60 m2. A 5ltr tub of PICSCOAT will similarly cover 10 m2 (but possibly more). If you are not sure how big your area is, please refer to our "Measure Your Drive" page for some guidance. If you choose to use the Simple 4 Step Process to order your PICSCOAT (starting with "Get Started" on the picture banner above), you will get a FREE Deluxe Application Kit consisting of a Tray, Roller Handle, 2 Rollers, Masking Tape and a Brush. Other Accessories – We also sell a range of other accessories that may be useful in your project. If you want to order accessories please click on the "PICSCOAT Shop" on the top Navigation Bar. You can also order your PICSCOAT using that link, rather than using the Simple 4 Step Process. 2. Order online from our secure webshop. 3. Watch the short Instructional Video. Once you have placed your order we will send you details of our Instructional Video which you can watch online. Applying PICSCOAT is a very simple process but the video will ensure you approach the job full of confidence, so it’s worth 10 minutes of your time! 4. Apply PICSCOAT to your surface. Just prepare the area, open the tub of PICSCOAT, stir thoroughly and roll / paint it on. It really is as simple as that! 5. Stand back and Admire YOUR Handiwork!! That’s it – job done! But do please email us with your observations as we use comments from our customers in staff training sessions. Call us if you get stuck! Applied my PICSCOAT yesterday. I was surprised that it was as easy as the dvd suggested and-yes- it does look absolutely stunning!! Thank you so much-will certainly be recommending to neighbours and friends.